This began as a small retreat house, in two halves connected by a central skylit entry, with full-height sliding doors on two sides and blank walls on the entry facades. 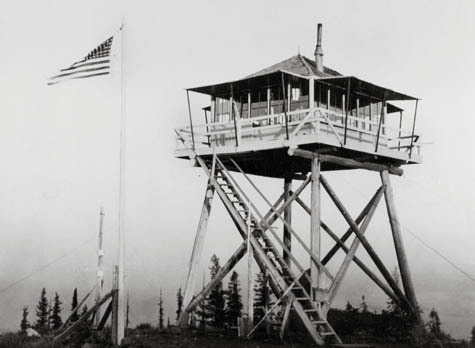 But, then I got to thinking, and decided to put it on stilts up in the air, like the fire lookout towers that dot the American West’s forests. Obviously, this necessitates a staircase, which I suggest making a conical spiral. To increase livable space in what would be an otherwise stuffy cabin, the entire steel structure has been wrapped to create an over-sized screened porch. While I started with a butterfly roof and tried out a hip roof, I find the dichotomy of the butterfly against the spindly supports to be rather compelling. Today, I’ve got something a little odd here at frame, four ‘L’-shaped towers surrounding a nine-square cubic courtyard. The exterior walls are bare brick, but for small observatories in the upper corners. The ‘house’ itself is broken into four independent towers, with public spaces grouped on the ground floor, connected via the large tree-filled courtyard, which acts as the main living room of the house, with baths and bedrooms located on the upper tower floors. In contrast to the bare brick exterior, the courtyard walls are detailed in a strict classical vocabulary, with pilaster colonnades wrapping floor upon floor. Kahn – an homage to Louis I. Kahn’s Center for British Art at Yale, where one of his pyramidal concrete skylights is placed above a more classically detailed library, contrasting the stark materiality of his modernism with the richness of the English country house which inspired it. Krier – Starting with a plan very much like Wright’s Charnley house, but facing its street façade with a stuccoed language taken from Leon Krier’s Perez Architecture Center at the University of Miami, all for the domestic scale of the single family home. Kiosk – Almost an exact reduplication of a small Tokyo ‘warehouse’ featured in a book by Atelier Bow-wow, ‘Pet Architecture Guide Book’, with a triangular floor plan topped by a butterfly roof, centering the downspout on the front façade. All I’ve done is perfect the geometry and replace a roll-up garage door with a french glass door.